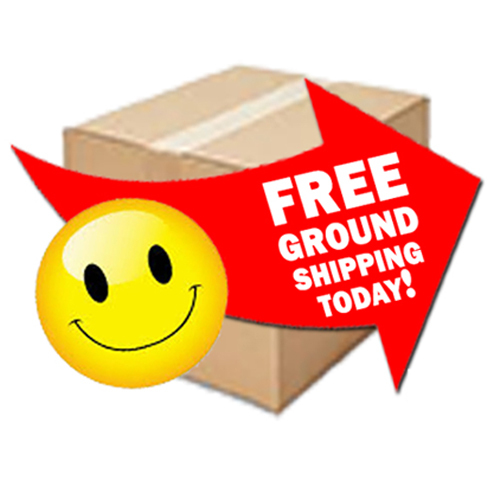 We offer FREE ground shipping on orders shipped to destinations within the Continental US. This offer is good for retail customers only, not resellers. Orders for parts, accessories, or services only are excluded. Irregular size or overweight orders are also excluded. We offer faster shipping (Expedited Ground, 3rd Day, 2nd Day and Next Day) for those who are willing to pay extra the cost. For our Canadian customers, we bundle you order our reduced shipping rates along with the lowest allowable brokerage fees, provincial taxes (if any), and import duties and then we pay these for you. This means you get your order delivered faster and at no additional charge. We ship around the world giving you the best possible prices we can—our lowest negotiated shipping rates. How Long Before Your Order Will Ship? We ship almost every order the same business day if placed before noon Eastern Time. This is faster than Amazon where most sellers take at least 2-3 days to ship even with Amazon Prime! And we don't charge an annual fee. You purchase items from more than one manufacturer. If your items weigh more than 150 pounds and need to be shipped as freight. Is your order total UNDER $750? By default, we ship all orders under $750 without a signature required for delivery unless you add Signature Required for Delivery to your order. Without this service, we will not be able to tell you who signed for your package and we will not be liable if it is lost or stolen. So depending on your shipping destination, you may wish to add this service on your own for a small fee. Click here to add Signature Required for Delivery to your cart before checking out. Is your order total $750 OR MORE? As a courtesy to our customers with larger orders, we provide free Signature Required for Delivery for orders of $750 or more. If that applies to your order, be sure there is someone present to sign for it or you may need to make special arrangements with the shipping carrier for delivery. If you don’t want this service, just indicate that in the Special Instructions or Order Comments box at check out. Contact us right away (preferably within 48 hours of receipt of your package), so we can fix the problem. Save all items, labels, and packaging, as they may be required to verify a claim. Be aware that the shipping company may need to inspect these items at your location before honoring a claim. You will be able to see exact shipping options and costs without registering or logging in. Just add the items you want to your Cart, click the Shopping Cart icon (at top of every page), and scroll down to see the Shipping Cost Preview. Set your Country, State, and Zip code to see the costs and options and click "Show Shipping Options". Shipping to a Military APO or FPO Address? Add the items you want to your shopping cart, as usual. for City, enter APO, FPO or DPO. Please note, we cannot estimate shipping times for APO, FPO, or DPO delivery because the US Military handles delivery once these packages arrive at the designated address. You will know exactly how much the charges will be before you place your order. Your brokerage fees will be reduced by up to 80%. There will be no additional charges upon delivery. You'll get your order faster. What are our Canadian customers are saying about this service? I wanted to let you know that your new hassle-free method of shipping via UPS here to Canada worked perfectly. The order arrived on my doorstep yesterday afternoon, no questions, comments or anything else about customs or shipping. If you have a credit card from a non-US bank, your card may be rejected if your address can't be verified. If this happens to you, please consider setting up a free PayPal account -- it only takes a few minutes and can be used instantly. Just go to www.PayPal.com to apply. Or, as an alternative, you may also choose to pay by Check/Money Order/Bank Wire Transfer. Orders shipped outside the USA that are over $750 USD must be shipped with a shipping carrier that provides a service called Signature Required for Delivery. As this service is generally a little more expensive, please consider placing several orders, each totaling less than $750 USD and each shipped separately if you want to avoid these charges. In order for us to ship an international order, it must be covered under PayPal's Seller Protection Plan. All orders that are paid with a PayPal account are automatically covered by PayPal's Seller Protection Plan. Most orders paid with a credit card are also covered. However, occasionally an order that is paid with a credit card is not covered. This may happen if you try to use a different shipping address on PayPal when you pay for your order, so be sure that the one you used when you created an account with us is the same one that shows in PayPal on the final payment screen. If your order is not covered under PayPal's Seller Protection Plan, we may need to refund your credit card payment and send you an invoice via PayPal and ask that you pay with a PayPal account. Free PayPal accounts are quick and easy to set up and can be used instantly. Go to www.PayPal.com to apply.